Bazaar is a much celebrated film, they say. And why not? It's got a stellar cast, a fabulously hard-hitting script, a setting that reminds one of the Hyderabad that is on the cusp of old times and modernity and seven hauntingly beautiful songs. Sagar Sarhadi's social commentary on the sad plight of girls from poor families in Hyderabad who get entwined in the commercial storm of lust and circumstances truly is the making of a brilliant film. But then, Sarhadi I believe is no Shyam Benegal. What is so marvellous about Mandi is its sharp tongue-lashing treatment of the sordid subject. 1982's Bazaar is honest, but in its many labyrinths there is a slight maze that is difficult to gauge. The film starts of with several questions. Though gradually the knots are loosened, it is too late to hold on to the interest. Perhaps, I'm the only one not absolutely impressed with the film. But then, I have reasons galore. Firstly, the execution is patchy. Sarhadi has everything in his fist, but he fails to maximise. He tries excessive poetry and imagery when he deliberately retains the cloud over what is happening. That Najma has a relation with Akhtar is clear but why she comes away from her ancestral home is a tad misty. What did Najma's mother demand of her and how come she blindly trusted Akhtar suddenly. This despite Salim loving her all the while. She keeps counting hours to get married to Akhtar and does everything to achieve the marital status, but is she so dumb so as not to realise that she is just a cog in this vicious cycle of crass commercialisation and greed? The dialogues are in chaste Hyderabadi Hindi and is the least bit difficult to understand. But they lack the spark somewhat. However, Bazaar's intent, no matter how hazy the treatment, is good. Casting light on the true state of poor girls in Hyderabad, it uses Najma to show how basically girls are nothing but mere commodities in the brash world. Young women are bought over by rich men twice their age to satisfy their crude carnal pleasures. If this is not prostitution, what is? Though shrouded by the garb of the legality of marriage and the veneer of sophistication. Akhtar's middle-aged, already married, boss is suffering from a mid-life crisis. He wants his sexual wants satiated by a young woman. He wants to bed a fresh maiden but only after marriage. This would make his sin more justified. He discusses the prospect with Akhtar (Bharat Kapoor) who in turn convinces Najma (Smita Patil) to fetch a young bride for the boss from her hometown in Hyderabad. Akhtar promises that this would ultimately save his job, the flat that the boss has given them and be a ticket to their marriage. Najma is dying to get married to Akhtar so, despite seeing through the wretchedness of the action that she is being forced to commit, agrees to look for a bride for the boss (a weak spoke in the sterling cast!). What riddles me is why Salim is accompanying the group to Hyderabad? Doesn't he have better things to do? Or maybe, Sarhadi wanted to project him as the mute spectator who knows that ghastly things are happening but is too meek to protest. Hence, even when Salim protests, by way of some ranting in a drunken stupor, they hardly have any effect on the crime-doers. A misunderstanding ensues and Najma thinks that Nasreen (Neesha Singh, a commendable debut. I have to tell her that the next time I meet her!) is Sarju's (Farooque Sheikh) beloved, a brother who loves Najma dearly. In a quiet party, the evil boss's eyes feast on the innocence and prettiness of Shabnam (Supriya Pathak), who is actually Sarju's sweetheart and he makes it known to Najma that he wants Shabnam as the wife. Shabnam belongs to a poor family and nothing would more make her parents happy than to get her married to an affluent man, no matter how old he is. Though her father balks, Shabnam's mother (Sulabha Deshpande) reasons with him saying that the money Shabnam's marriage would bring in would be helpful in finding suitors for their elder daughter. So, practically they are selling off Shabnam. The young girl, who is blindly in love with Sarju, pleads and begs her mother to pardon her, but her life gets stuck in the cruel cycle of poverty, greed, lust and ultimate destruction. There are some brilliant touches in the film. Like when Shabnam tells Sarju to hide her from the eyes of the cruel world after marriage. She just wants to be his sweetheart, loved and cared by him. But little does she know that despite all her efforts every lusty eye will single her out to satisfy their heinous carnal pleasures. This is true for all girls like her. Smita Patil delivers a tremendous performance and so does Farooque Sheikh, Naseeruddin Shah and Supriya Pathak. Even Bharat Kapor is not bad. They somehow make up for the lack of a more solid and gritty screenplay. The love story between Sarju and Shabnam is innocent, pristine and and full of tenderness. It's heart-wrenching how their flower of love is nastily nipped in the bud. Farooque Sheikh is brilliant as the unassuming yet fresh Sarju and Supriya Pathak is a sweet sensation as Shabnam. Hi Sharmi! I have heard only good things about this one. And I absolutely love each and every song of this album. Wanted to watch it since a long time. 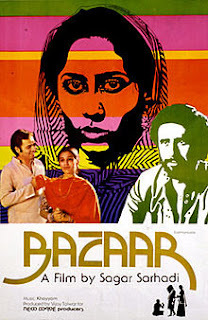 But after watching Mandi, I was a bit apprehensive about Bazaar. Mandi shook me and I had to try really hard to come out of it. I am just gathering enough courage to watch Bazaar. And now after reading your review, I don't know whether I should or not. Waise, I know I would watch it surely but don't know what to expect from it. By the way, good writeup, as usual. @Punya: Hello Punya. I found Mandi just fabulous. Benegal was a genius in showcasing a sorry theme by way of a comic satire! It's bound to leave a lasting impression in your mind. Bazaar, on the other hand, is hardly as impressive. Yes, the subject is serious and worth discussion but am not sure the treatment is top-notch. I am slowly beginning to realise just how many 80s films I missed - even though I had read and heard enough about them to know that they were highly acclaimed - because I was too young to watch them when they were released. Bazaar had an A certificate, didn't it? So have ended up never watching it. But yes, the songs are fabulous. @Dustedoff: Trust me, the film has nothing that deserves an A-certificate. If you think that toying with the subject of commercialization of girls in society is adult enough, then films like Mandi and Mirch Masala should have also got the A-mark. However, Bazaar is no Mandi and doesn't even come come close to a gem like Mirch Masala. See Bazaar and you will know why I say so. Songs are great but I feel that's about it. @Anu: Yes, I think you can see it once. Perhaps, you will like it. But somehow I found it slow and badly executed! @Sharmi: I was just watching Dikhaye diye song on Raina Beeti Jaye programme on Sony Mix couple days ago but couldn't recall the story line since I watched this long ago. Thanks for posting this! Najma takes Salim along with her to Hyderabad because she finds herself relying more and more on him, and does not want to face her hometown without him. Salim, of course, cannot refuse anything that Najma asks of him. You are right, the story does falter now and then, but overall, a beautiful film. I thought the last 'statement' that Najma and Salim make facing the camera was wholly unnecessary.